Damp has become a huge problem in many people’s lives and it can manifest itself in so many ways. What you need to know is whether damp is present, if so what type of damp is it and then identify the cause of the damp because then you can specify the best course of action to take. Rising damp is one of the least common types of damp; as its name suggests it rises from the ground and can be found in buildings which do not have a damp proof course present. However, rising damp can occur in buildings which have a damp proof course present but it may have become damaged and failed due to a number of possible reasons, 'bridging' is a common cause of failed damp proof courses. Visible by tide marks which appear in the wall normally to a height of 1m, rising damp is easy to identify by an expert. The tide marks and staining is caused by chloride and nitrate deposits which are known as hygroscopic salts left in the wall and plaster when the dampness evaporates. These salts will remain present and have the ability to obtain moisture unless a specially formulated plaster mix is applied or alternatively waterproof membrane can be applied works by providing a gap between the membrane and the wall for free water to run through whilst protecting the interior walls. 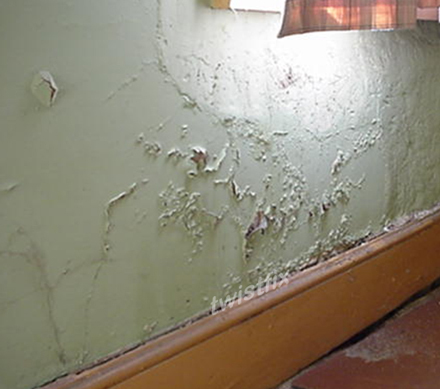 Penetrating damp unfortunately is caused because of poor property maintenance. Items such as defective plumbing and blocked gutters which can cause overflows and these combined with a number of environmental factors can cause damp to penetrate through a structure. Blocked gutters can easily be prevented using our fantastic gutter guard which is of course available from Twistfix. This particular type of damp can penetrate the structure of the building and this can cause internal adjacent timbers becoming damp and as a result degrading through dry rot and wet rot infestations. Speak to us today about our penetrating damp treatment which is applied to the effected surface. Condensation damp is caused when there is inadequate air flow and ventilation within a property. The walls become damp which then causes damage to plaster surface as well as black mould. Unfortunately there will be a musty smell when this type of damp present and this is extremely unpleasant. Twistfix supply a number of anti-condensation products which can be used to control humidity within our homes and other buildings in order to eradicate condensation damp. Our ventilation fans, heat recovery units and positive input ventilators can control condensation, reduce damp and also alleviate black mould growth which isn’t as mentioned very pleasant. Through constant circulation of gently pressurised air which then will expels stale and humid air from the building. What happens if I leave my damp problems untreated? Leaving damp problems untreated is probably not the cleverest of things to do. The earlier the problem is identified and treated the less effort and cost involved. As you leave damp to progress it will become a lot worse in the form of timber decay, damage to the brickwork, damage to plaster as well as increasing your risk of dry rot and even infestations from a number of insects. What should I do if I have damp problems? If you are experiencing damp problems within your home then you should speak to our technical team at Twistfix and we can put you in contact with a registered contractor who will be able to properly identify this for you on your behalf and then choose the best solution in order to treat and eradicate the damp completely.